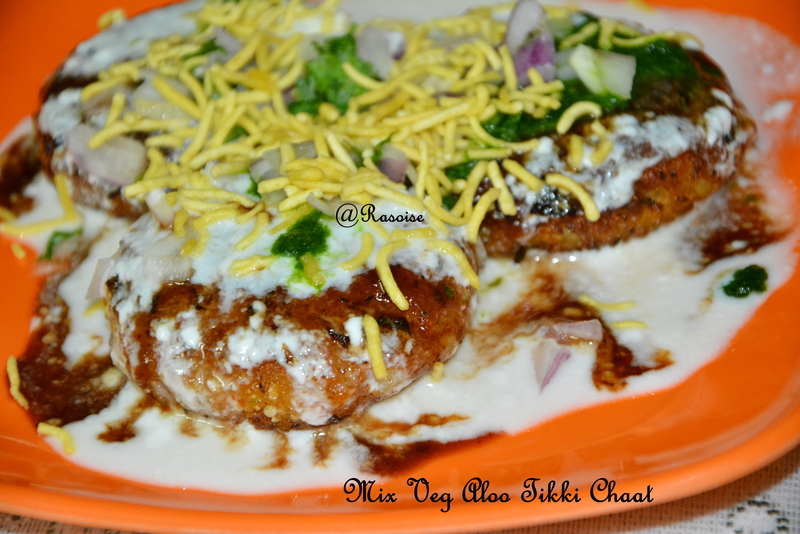 Aloo tiki chaat is pretty famous as street food in North India. 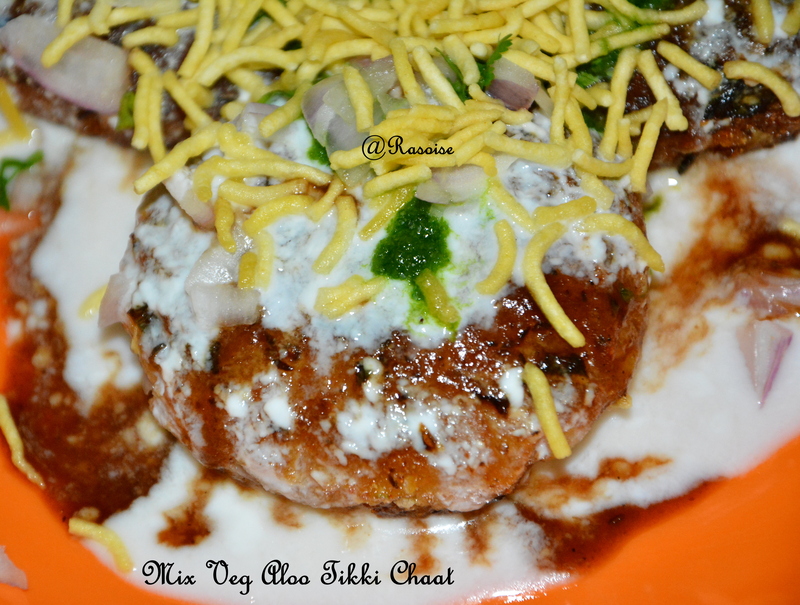 As the winters approach the stall for tikki chaat increases on the street. 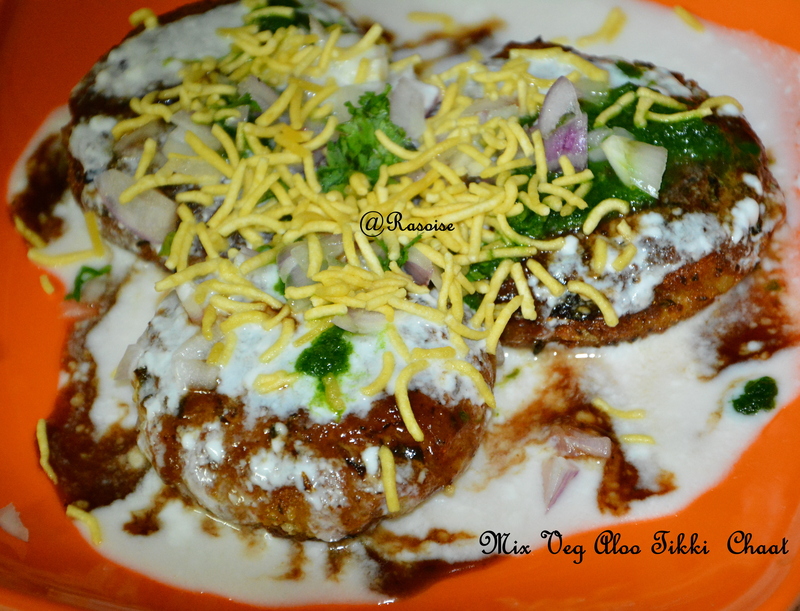 Regular Aloo Tikki, I have already discussed in Veg Burger recipe. I have made little variations here by using few seasonal veggies like cabbage, cauliflower, beans and peas. This makes the tikki nutritious and more tasty. This tongue tickling chaat includes chana daal stuffed mix veggie spicy tikki with tangy tamarind and coriander mint chutney. I have shallow fried the tikkis, if desired you can deep fry for more crispness. Green chilli (Chopped) – 2 nos. Soak channa daal in water for 2 hours. Drain water add salt and 3/4 cup water and pressure-cook it for 2 whistles over medium flame. Transfer cooked channa daal to a colander and remove excess water. Cooked chana dal should be whole and separated from each other. Let it cool. Add dry mango powder, salt and red chilli powder. Take boiled potatoes in a large bowl. Add grated cabbage and cauliflower, boiled peas, chopped beans, chopped onion, chopped green chilli, corn flour, and salt in it and mix well. Take a bowl with water, dip the bread slices to it and immediately squeeze excess water. Add wet and crushed bread, red chilli powder, dry mango powder to the potato mixture. Mix it well. Divide prepared mixture into 12 equal portions. Give each portion a round shape of ball and press a little to make a thick tikki. Put 1teaspoons filling in the center of the tikki. Wrap filling from all sides and make round ball. Again press a little and flatten stuffed ball into a tikki. Repeat the process for remaining portions. Heat a non stick pan and drizzle some oil to it. Place 4 tikkis and cook for few minutes each side. Cook until each side turns brown and crisp. Transfer it to a plate. Repeat steps for remaining tikkis. Stuffed mix veggie aloo tikkis for chaats are ready. Take 3 aloo tikkis in a serving plate. 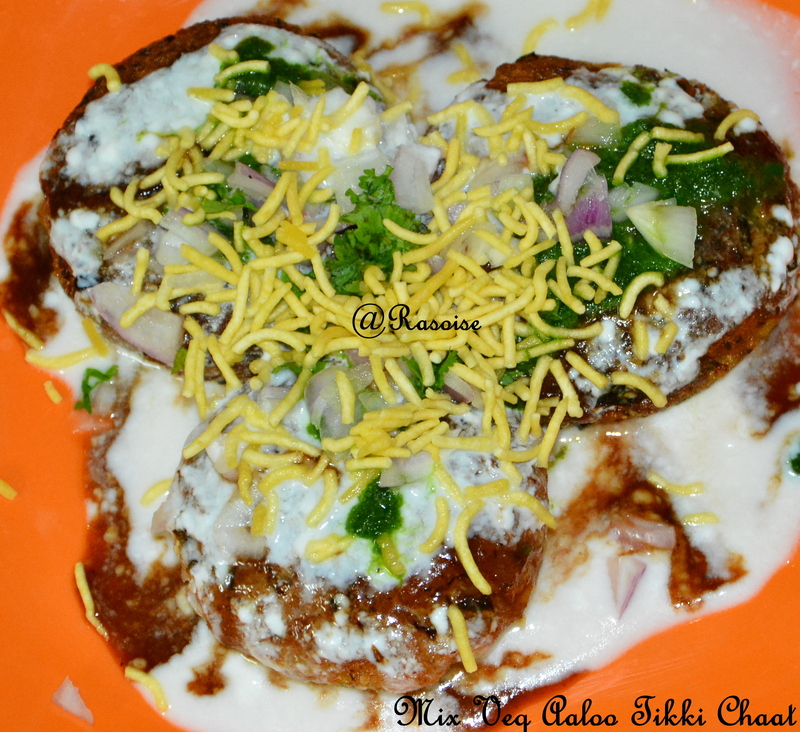 Top each tikki with 2 teaspoon of beaten curd, followed by 1 teaspoon green chutney, 2 teaspoons date-tamarind chutney. Sprinkle some chaat masala. Garnish with chopped onion, chopped coriander leaves and sev. Prepare remaining serving plates and serve immediately. 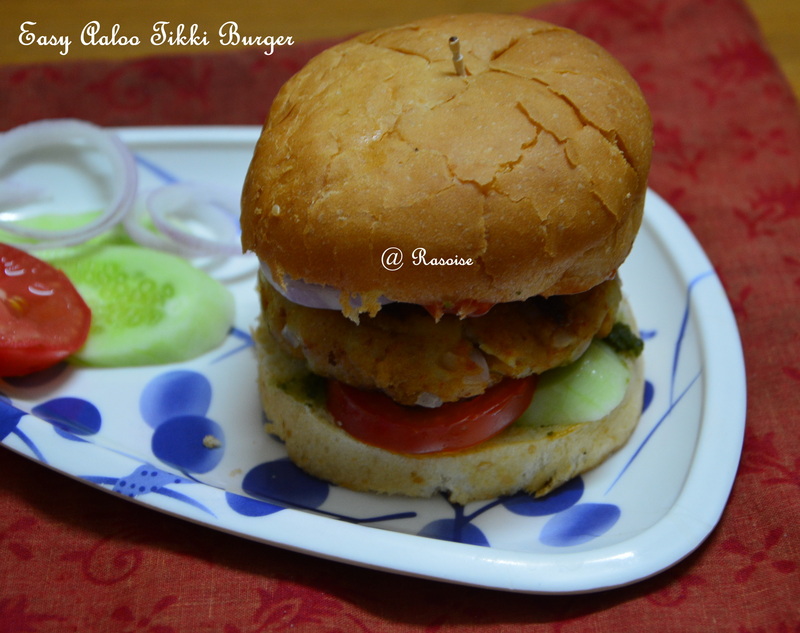 Aaloo tikki burger is famous amongst kids. They like it a lot. Well it is famous amongst youngsters as well. 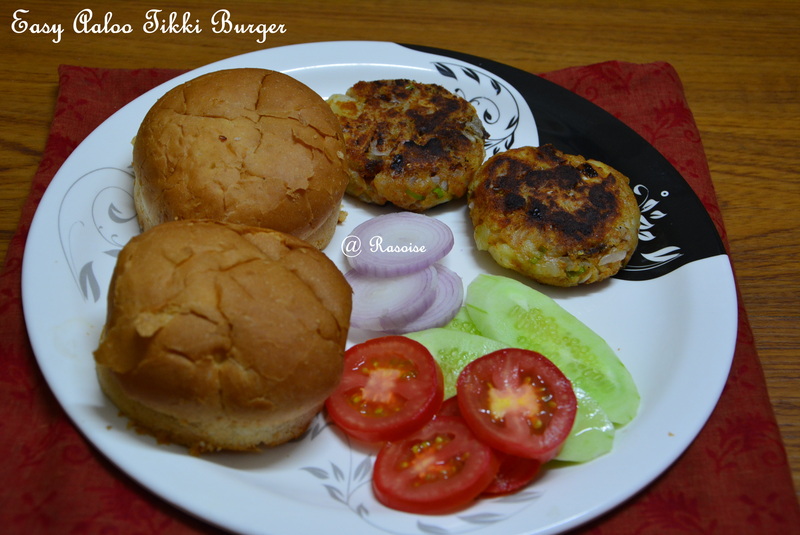 Whenever I have carving for tikki or burger, I make this easy burger recipe with easily available ingredients in my kitchen. 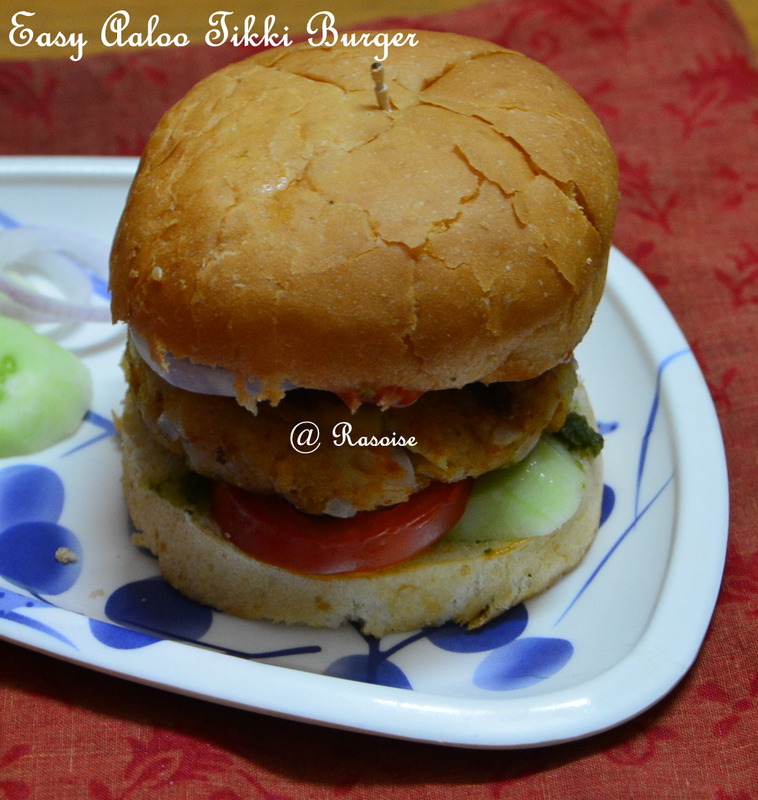 This aaloo tikki burger is complete Indian style with tamarind chutney, coriander chutney in it. To make it healthy, I have used few veggies like capsicum and peas. Cucumber, tomato and onion are used as toppings. 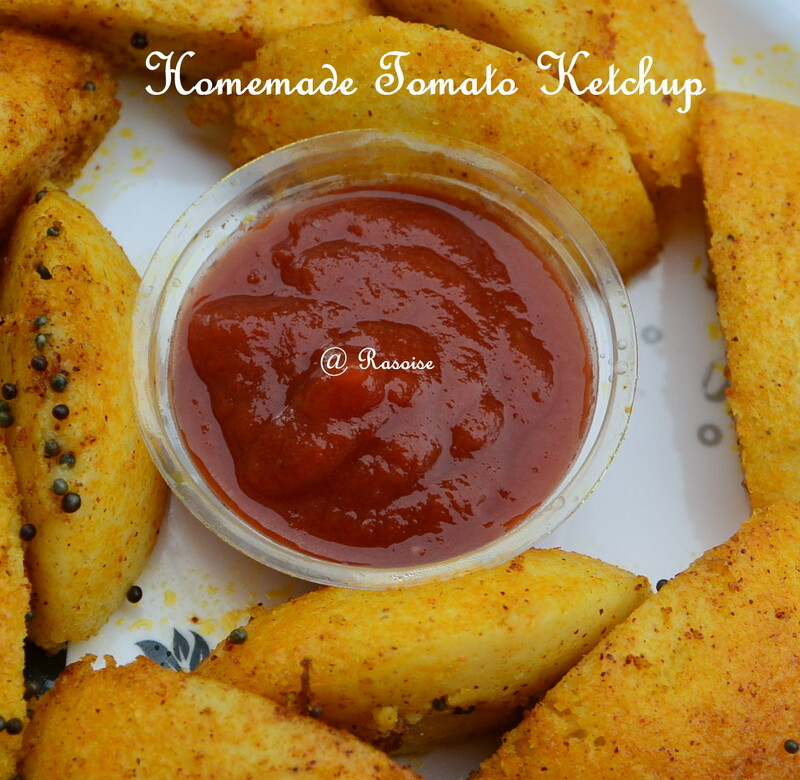 This tastes good with tomato ketchup. To make it more healthy, the tikkis are shallow fried on a nonstick griddle. Generally the tikkis in the burgers (available in streets) are deep fried which adds on to the calories. Boil the potatoes, peel the skin and mash in a big bowl. Boil the peas in an open pan for five minutes, drain the water and add to the mashed potatoes. Add bread crums and chopped coriander leaves. Now add other spices. Mix them thoroughly to make a firm concrete mixture. Divide the mixture into six balls of equal size. Press each potato ball between the palms to make the tikki. Heat the non stick griddle, dizzle little oil (if desired), place the tikkis and cook on bothe the sides till brown. Repeat the process with other tikkis. Burger Bun – 6 nos. Slit the bun to half. Heat the griddle, heat the bun halves on the griddle for few seconds. Remove from griddle. Spread mayonnaise on one half bun. Place a onion slice on it. Now place one aaloo tikki on it. If required press it little. Spread coriander and tamarind chutney on another half and tightly close the bun. I have used a toothpick to tie it firmly.